Don’t order chest radiographs in children with uncomplicated asthma or bronchiolitis. National guidelines articulate a reliance on physical examination and patient history for diagnosis of asthma and bronchiolitis in the pediatric population. Multiple studies have established limited clinical utility of chest radiographs for patients with asthma or bronchiolitis. 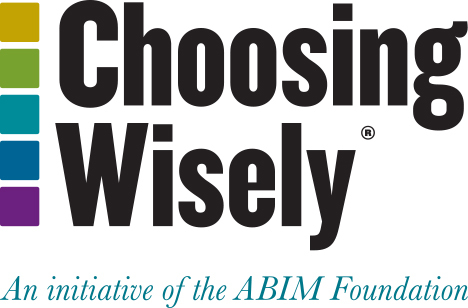 Omission of the use of chest radiography will reduce costs, but not compromise diagnostic accuracy and care. Don’t routinely use bronchodilators in children with bronchiolitis. Published guidelines do not advocate the routine use of bronchodilators in patients with bronchiolitis. Comprehensive reviews of the literature have demonstrated that the use of bronchodilators in children admitted to the hospital with bronchiolitis has no effect on any important outcomes. There is limited demonstration of clear impact of bronchodilator therapy upon the course of disease. Additionally, providers should consider the potential impact of adverse events upon the patient. Don’t use systemic corticosteroids in children under 2 years of age with an uncomplicated lower respiratory tract infection. Published guidelines recommend that corticosteroid medications not be used routinely in the management of bronchiolitis. Furthermore, additional studies in patients with other viral lower respiratory tract infections have failed to demonstrate any benefits. Don’t treat gastroesophageal reflux in infants routinely with acid suppression therapy. Antireflux therapy has been demonstrated to have no effect in reducing the symptoms of grastroesophageal reflux disease (GERD) in children. Concerns regarding the use of proton-pump inhibitor therapy in infants include an inability to definitively diagnose pediatric patients according to the established criteria of GERD, lack of documented efficacy of acid suppression therapy in infants and the potential adverse effects associated with acid suppression therapy. Don’t use continuous pulse oximetry routinely in children with acute respiratory illness unless they are on supplemental oxygen. The utility of continuous pulse oximetry in pediatric patients with acute respiratory illness is not well established. Use of continuous pulse oximetry has been previously associated with increased admission rates and increased length of stay. The clinical benefit of pulse oximetry is not validated or well documented. Representing the fastest growing specialty in modern healthcare, the Society of Hospital Medicine (SHM) is the leading medical society for more than 34,000 hospitalists and their patients. SHM is dedicated to promoting the highest quality care for all hospitalized patients and overall excellence in the practice of hospital medicine through quality improvement, education, advocacy and research. Over the past decade, studies have shown that hospitalists can contribute to decreased patient lengths of stay, reductions in hospital costs and readmission rates, and increased patient satisfaction. A Delphi panel of pediatric hospital medicine physicians with wide geographic representation was convened by the Society of Hospital Medicine (SHM). The panel developed an initial list of 20 items with input from colleagues at each of the panelists’ home institutions, which was then discussed and reduced to 11 items via consensus of the panel. A comprehensive literature review was undertaken for these 11 items, while they were concurrently circulated on the electronic listservs of SHM’s Pediatric Committee and the American Academy of Pediatrics’ Section on Hospital Medicine. The collated comments along with the results of the evidence review were then presented to the members of the panel. Two rounds of Delphi voting took place via electronic submission of votes by the panel. Validity and feasibility of each item was assessed by the Delphi panel on a nine-point scale for each of the 11 items and the mean of each item was obtained. The aggregate score of the means of validity and feasibility decided the final five items. These recommendations were then submitted to the SHM Board for review and approval. SHM’s disclosure and conflict of interest policy can be found at www.hospitalmedicine.org. American Academy of Pediatrics, Diagnosis and Management of Bronchiolitis, Subcommittee on Diagnosis and Management of Bronchiolitis, Pediatrics. 2006 Oct; 118(4):1774-93. National Heart, Lung and Blood Institute, National Asthma Education and Prevention Program. Expert panel report 3: Guidelines for the diagnosis and management of asthma. Bethesda (MD): National Institutes of Health; 2007 Aug. 417 p. Report No.:07-4051. Dawson KP, Long A, Kennedy J, Mogridge N. The chest radiograph in acute bronchiolitis. J Paediatr Child Health. 1990 26(4):209-211. Roback MG, Dreitlein DA. Chest radiograph in the evaluation of first time wheezing episodes: review of current clinical efficacy. Pediatr Emerg Care. 1998 Jun;14(3):181-4. American Academy of Pediatrics. Diagnosis and Management of Bronchiolitis, Subcommittee on Diagnosis and Management of Bronchiolitis. Pediatrics. 2006 Oct;118(4):1774-93. Gadomski AM, Brower M. Bronchodilators for bronchiolitis. Cochrane Database Syst Rev. 2010;(12):CD001266. Klassen TP, Sutcliffe T, Watters LK, Wells GA, Allen UD, Li MM. Dexamethasone in salbutamol-treated inpatients with acute bronchiolitis: A randomized, controlled trial. J Pediatr. 1997 Feb;130(2):191-6. Patel H, Platt R, Lozano JM, Wang EE. Glucocorticoids for acute viral bronchiolitis in infants and young children. Cochrane Database Syst Rev. 2004;(3):CD004878. De Boeck K, Van der Aa N, Van Lierde S, Corbeel L, Eeckels R. Respiratory syncytial virus bronchiolitis: a double-blind dexamethasone efficacy study. J Pediatr. 1997 Dec;131(6):919-21. Von Woensel JB, van Aalderen WM, Kimpen JL. Viral lower respiratory tract infection in infants and young children. BMJ 2003 Jul 5;327(7405):36–40. Panickar J, Lakhanpaul M, Lambert PC, Kenia P, Stephenson T, Smyth A, Grigg J. Oral prednisolone for preschool children with acute virus-induced wheezing. N Engl J Med. 2009 Jan 22;360(4):329-38. Vandenplas Y, Rudolph CD, Di Lorenzo C, Hassall E, Liptak G, Mazur L, Sondheimer J, Staiano A, Thomson M, Veereman-Wauters G, Wenzl TG, North American Society for Pediatric Gastroenterology Hepatology and Nutrition, European Society for Pediatric Gastroenterology Hepatology and Nutrition. Pediatric gastroesophageal reflux clinical practice guidelines: joint recommendations of the North American Society for Pediatric Gastroenterology, Hepatology, and Nutrition (NASPGHAN) and the European Society for Pediatric Gastroenterology, Hepatology, and Nutrition (ESPGHAN). J Pediatr Gastroenterol Nutr. 2009;49:498–547. van der Pol RJ, Smits MJ, van Wijk MP, Omari TI, Tabbers MM, Benninga MA. Efficacy of proton-pump inhibitors in chi ldren with gastroesophageal reflux disease: a systematic review. Pediatrics. 2011 May;127(5):925-35. Gibbons TE, Gold BD. The use of proton pump inhibitors in children: a comprehensive review. Paediatr Drugs. 2003;5(1):25-40. Orenstein SR, Hassall E. Infants and proton pump inhibitors: tribulations, no trials. J Pediatr Gastroenterol Nutr. 2007;45:395–8. Khoshoo V, Edell D, Thompson A, Rubin M. Are we overprescribing antireflux medications for infants with regurgitation? Pediatrics. 2007 Nov;120:946–9. Schroeder AR, Marmor AK, Pantell RH, Newman TB. Impact of pulse oximetry and oxygen therapy on length of stay in bronchiolitis hospitalizations. Arch Ped Adolesc Med. 2004 Jun;158(6):527-530. Hunt CE, Corwin MJ, Lister G, Weese-Mayer DE, Neuman MR, Tinsley L, Baird TM, Keens TG, Cabral HJ. Longitudinal assessment of hemoglobin oxygen saturation in healthy infants during the first 6 months of age. J Pediatr. 1999 Nov;135(5):580-6. Alverson BK, McCulloh RJ, Koehn KL. Continuous versus intermittent pulse oximetry monitoring of children hospitalized for bronchiolitis. Abstract presented at IDWeek 2012. Sand Diego (CA). 2012 Oct 19.